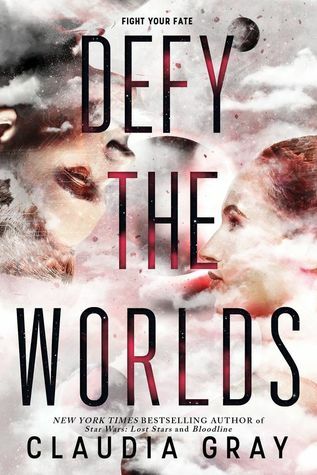 Review In A Nutshell: Defy the Worlds is a fantastic sequel to an equally fantastic book. It’s action-packed, adorably romantic, and full of fun (and slightly terrifying) science and technology. Claudia Gray kills it in this book. Taking place after the events of Defy the Stars, our two heroes are separated and having to deal with their new life. Naomi is an outcast in her own world, but when a plague strikes her planet she’s their only hope. Abel is doing his best to stay out of Mansfield’s clutches, but when he hears Naomi is in danger, he will do anything to save her. The plot is fast paced and exciting, with just a hint of creepiness, the writing is great, but the setting. The setting remains as one of the aspects of this book that really sets it apart. Each planet is so different and described so vividly, you will be imaging you are there with the characters. Defy The Worlds manages to include familiar settings from the first book, while also introducing brand new locations for you to explore with Noemi and Abel. I can’t go into too much detail (no spoilers!) but I can say its really fun seeing these new places along with the old. By far, my favorite part of this series is the characters. Defy The Worlds brings back all of our favorite characters (some when you least expect it), while also introducing a few newbies into this world. Noemi’s development wasn’t as pronounced in this book as it was in the first, but it was definitely still there and I can see this book setting her up to change even more as a character in the next installment. Another interesting aspect of Defy The Worlds was the overall themes. I’m going to try to not sound like I’m writing an essay for 11th grade english class, but we’ll see how that goes (maybe it’ll sound like 12th grade english class. That’d be fun). In comparison to the first book, religion didn’t play as big of a role, but it was definitely still discussed and mentioned often. One of the recurring questions in this book is “What are you fighting? And what are you fighting for?” For Noemi especially, this question is harder to answer than it seems. Also in this book, the theme of humanity vs. machine, and what the difference is, is continued to be explored and debated by various characters throughout the story. I personally love reading about this, but I could be biased considering I’m a computer engineering major who wouldn’t be opposed to creating an AI even if it could take over the world (I mean- that would just be so fascinating!) (yeah I’d definitely be the mad scientist villain in a YA book. Maybe Mansfield is hiring). Cons – WHY DOES CLAUDIA ALWAYS HAVE TO MURDER ME WITH THESE ENDINGS?! Defy The Worlds is amazing. Claudia Gray has created a universe so bright and intriguing while also being frightening in its flaws and dark side. I’m glad that Defy the Worlds was as good as the first novel! It definitely was!! I can’t wait for book 3!!! Ooooo I gotta buy the sequel this sound soooo good!